Sister Priscilla Wood, Promoter of Arts and Cultural Heritage for the Dominican Sisters of Sinsinawa, and Donna Carroll holding the inaugural Cornerstones Award. 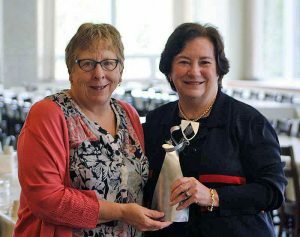 River Forest, IL – Dominican University President Donna M. Carroll was presented with the inaugural Cornerstones Award from the Sinsinawa Dominican Sisters, the founders of the university, during a ceremony at the Mound on Monday, May 14. Carroll was honored for modeling the hope, courage, vision and faith embodied by the first four professed members of the Sinsinawa Dominican congregation—Sister Clara Conway, Sister Josephine Cahill, Sister Ignatia Fitzpatrick and Sister Rachel Conway—which was founded by Father Samuel Mazzuchelli in the mid-19th century in southeastern Wisconsin. “The story of the Sinsinawa Dominican Sisters starts in 1846, when the lives of several young women in the area intersected with the life of Father Samuel Mazzuchelli,” explained Sister Toni Harris, prioress of the congregation, during the ceremony. “Father Samuel came to call four of these sisters ‘cornerstones’ among the community of sister educators. The story continues in 1994, when the life of one of the youngest female leaders in higher education intersected with the lives of our community of Dominican Sisters of Sinsinawa and Rosary College (precursor to Dominican University). This young leader, Donna Carroll, has herself become a cornerstone in the story of Dominican University and the wider world of higher education, especially Catholic higher education. “One of Donna’s first challenges was being the first lay leader of a college led by Sinsinawa Dominican Sisters for nine decades. Our constitution reminds us that at the heart of our ministry is relationship. Our relationship with you—as a woman, a sister and a feminist—is sustained by the bonds of caritas and veritas. Donna, truly, you are our sister,” she continued. Sister Toni credited Carroll for leading Dominican University’s impressive growth for more than two decades, including increases in student enrollment, faculty hiring and degree programs, purchase of a satellite campus, construction of new buildings and the management of two successful capital campaigns collectively raising over $120 million. The university is currently conducting a third capital campaign under Carroll’s watch. Carroll also managed the university’s name change from Rosary College in 1997. “We are extremely proud of your public and strong support of undocumented students and your leadership of the university’s sanctuary campus resolution. In November, 2017, Dominican University received the Saint John Paul II Award from the Archdiocese of Chicago in recognition of its long-term support of Hispanic and undocumented students,” said Sister Toni. More than half of Dominican University’s student body is comprised of minority students, more than half of all undergraduate students are the first in their families to attend college, and more than half are from families eligible for financial aid based on economic need. At the same time, Dominican has increased its number of academically talented students as well as its graduation rate. In 2017, U.S. News & World Report ranked Dominican University in the top 20 of Midwest regional universities and fifth in the Midwest in its “Best Value” category. In her remarks, Carroll credited Sister Kaye Ashe, the prioress in 1994, with convincing her fellow Rosary College trustees that the institution was ready for its first lay president. She admitted that she did not expect to stay at Dominican as long as she has—24 years—but that the sense of place and relationship that she discovered was life changing. “When asked about the vitality of the university today, I often say that Dominican has ‘good bones.’ And, while Father Samuel would delight in our beautifully built campus, he would understand that the bones to which I refer are not structural but, rather, the traditions, values and stories that give meaning and resilience to our work—and our lives,” she said. In thanking the Sinsinawa Dominican Sisters for recognizing her with the inaugural Cornerstones Award, Carroll asserted that their confidence and affection have been the cornerstones of her presidency.